The Major League Baseball Awards season got underway this evening with the AL and NL Rookie of the Year (RoY) Awards. The Yankees’ freshmen duo of Miguel Andujar and Gleyber Torres comprised two of the three finalists for the AL RoY. Shohei Ohtani represented the third finalist and the 2018 RoY winner. But, in my opinion, he shouldn’t have been under consideration. Not only was he a professional player in Japan for five seasons but he wasn’t able to have a complete Major League season as both a hitter and/or pitcher. Unfortunately, Ohtani’s selection came as no surprise. Not all of the members of the Baseball Writers Association of America (BBWAA) feel that pro players from Japan, Cuba, etc. should be eligible for the RoY Award. They have not been consistent in the criteria considered when handing out the Award. The divergence of opinions began in 1995 when the LA Dodgers’ Hideo Nomo won the NL RoY after starting 139 games for the Osaka Kintetsu Buffaloes in the Japan Pacific League (JPPL). As a first-year Dodger, Nomo finished 13-6, 2.54 in 28 starts. Nomo led the league with 236 strikeouts and 11.1 K/9 IP. Nomo, who turned 27 during the 1995 season, beat out Atlanta’s Chipper Jones by 14 votes. The Seattle Mariners had back-to-back Japanese import winners in 2000/2001 with Kazuhiro Sasaki and Ichiro Suzuki. Sasaki was a veteran of 10 JPPL seasons. The then-32-year old reliever made 63 appearances and recorded 37 saves in 40 opportunities. In the AL RoY voting, he easily outdistanced the Oakland A’s Terrence Long by 21 votes. A year later, Ichiro, one of the greatest hitters of all time, took MLB by storm. After spending 10 seasons with the Orix Blue Wave of the JPPL, Ichiro arrived in the US with the most hype of any foreign-born player with previous professional experience. He also brought with him 1,278 career hits and 199 stolen bases and had hit .387 in his final year in Japan. The hype was well deserved. He led the league with 242 hits, a .350 batting average, 56 stolen bases, and produced an .838 OPS. He captured the RoY Award in a landslide over Cleveland’s CC Sabathia. Ichiro also became the first player since Boston’s Fred Lynn (1975) to win both the AL RoY and MVP Awards in the same year. He defeated A’s rookie Jason Giambi by just eight votes. The “Giambino” recorded an 1.137 OPS with 38 home runs, 120 RBI, 129 walks, and a .342 batting average. Two years later, the BBWAA had a change of heart and caused a major stir among fans and their fellow voters and members of the media. Though his home runs (16) didn’t come close to approaching the power he displayed in Japan (332 career home runs), Matsui drove in 106 runs, played in all 163 regular season games, and a had a .287/.353/.435 split. That same season, the Kansas City Royals’ Angel Berroa burst onto the scene. The 25-year old shortstop hit .287/.338/.451 with 17 HR and 73 RBI. Additionally, he stole 21 bases in 26 attempts and struck out 100 times. Berroa captured the RoY Award by a mere four votes over Matsui because two writers – Bill Ballou and Jim Souhan – left Matsui completely off their ballots. Fast forwarding to the 2018 season, the buildup surrounding Ohtani was second only to when Ichiro arrived in the US. Though just 23-years old, Ohtani spent five seasons with the Nippon Ham Fighters of the JPPL. He had developed into one of the best pitchers in Japanese baseball as well as a top-flight hitter. He wanted to find a team for which he would both pitch and get most of the team’s at-bats as their designated hitter. That team turned out to be the Los Angeles Angels. Ohtani’s pitching was cut short due to a torn Ulnar Collateral Ligament (UCL) that resulted in Tommy John surgery at season’s end. He threw 51.1 innings (10 starts) with 11.0 K/9 IP, a 3.31 ERA and a WHIP under 1.2. While Ohtani’s numbers were very good, there was no chance to see if Major League hitters would adapt to his approach to the game and whether or not he would eventually have to make some tweaks to his approach. In 367 plate appearances, Ohtani’s splits were .285/.361/.554. He hit 22 HR, drove in 61 runs, and struck out 102 times. Very good numbers (outside of the strikeouts), but to me they were again too limited in scope. By comparison, Andujar wasn’t able to win a job out of Spring Training. Torres, not Andujar, was one of the top prospects in all of the baseball and he proved it once the Yankees called him up. 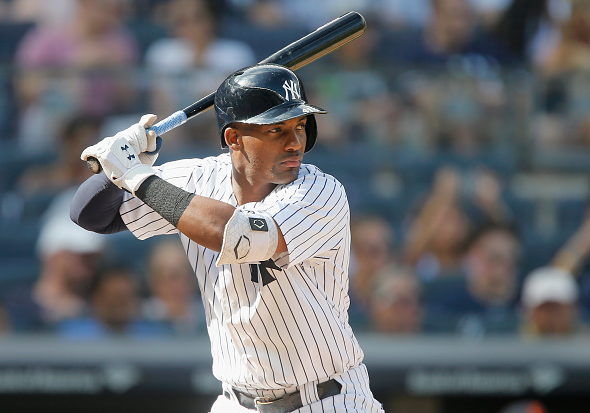 Andujar, on the other hand, got off to a slow start, but both players’ fortunes changed as the season wore on. Torres went down with an injury and upon his return, he did not hit with the same consistency that he had previously shown. “Miggy” appeared in 149 games and produced like a veteran. He hit 27 home runs and broke Joe DiMaggio’s franchise rookie record with 47 doubles. Andujar’s .297/.328/.527 split looks even better when you consider he only struck out 97 times in 606 plate appearances. Andujar’s biggest weakness was his defensive issues. He committed 15 errors at third base and his .948 Fielding Percentage was .010 lower than the league average. Fangraphs rated Andujar 19th defensively among Major League third baseman. No real difference between right-handers and left-handers. An excellent OPS in a ballpark that favors left-handed hitters. The numbers don’t lie and they add up to AL Rookie of the Year. Unfortunately, the BBWAA disagreed.